Surprisingly, I had never heard of the Notting Hill Carnival before Kacie of The Rare Welsh Bit invited me to attend. Not sure why I hadn’t since it’s only the second-largest street carnival in the world. 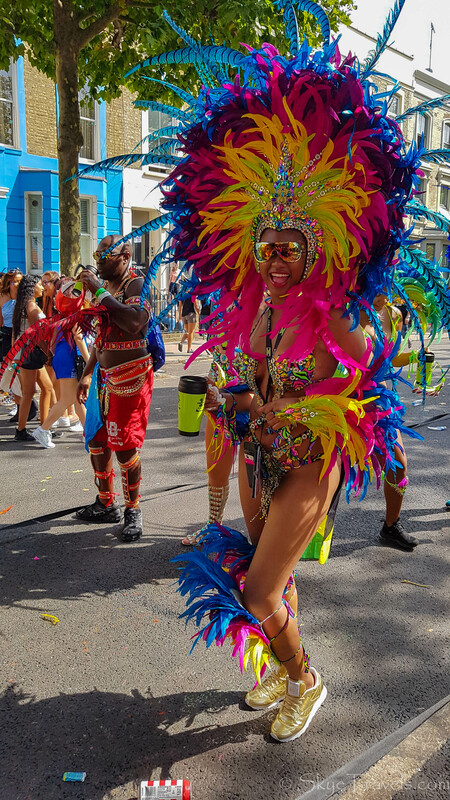 Since 1966, the Notting Hill Carnival has taken place in and around the Notting Hill district of London, just west of Hyde Park and Kensington Gardens. The festival was originally organized to promote racial unity after the 1958 Notting Hill riots. 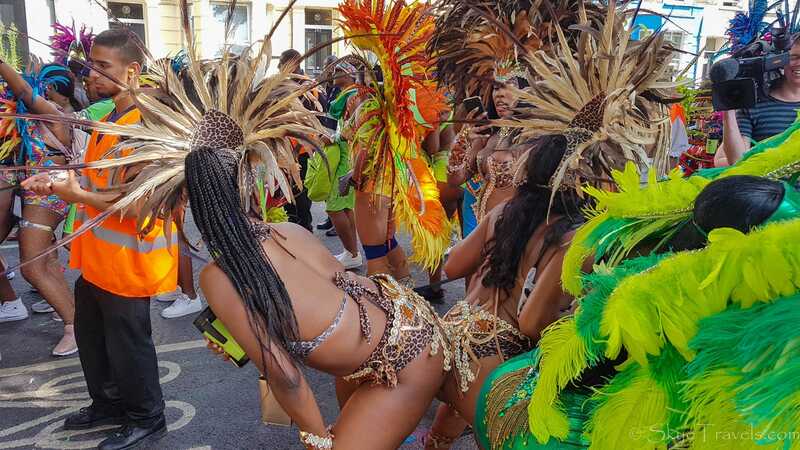 Since then, it has been not only an outlet for Caribbean culture in London, but also forwards a multitude of other objectives, such as inspiration, integration, engagement and education. This year, a tribute to the Greenfell Tower Fire was also held at 3 PM with a minute of silence for the victims of the fire. The event takes place each year on the Late Summer Bank Holiday (the last Monday of August), and the preceding Sunday. Upwards of two million people attend the festival, roughly 80% of which are locals. Sunday is considered “kid-friendly” insomuch as the festival is less rowdy than Monday when the parade hits the streets and walking through the crowd can become oppressive. I heard a lot of concern over safety at the festival. It was recommended I didn’t bring anything of value with me, and to leave the festival before it got too late at night. I heeded the warnings, taking only the bare essentials in a small, secure backpack. Another suggestion was to take a bum bag (fanny pack to Americans) to keep your possessions in, but I didn’t have one of those. The police presence was strongly felt, with over 9000 policemen on the job patrolling the streets. While there have been problems in the past, the festival is relatively safe compared to other events. In fact, there have only been five deaths in over half a century. That’s almost half of what Disneyland has had over the same time period. 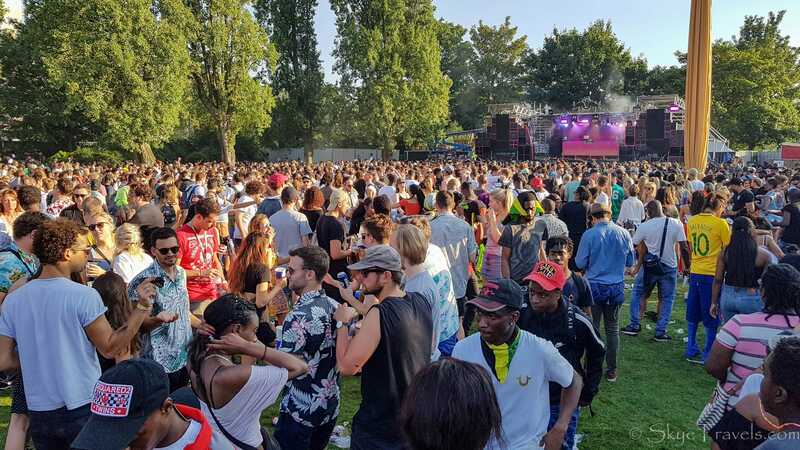 Although there was a big scare of an acid attack this year, the biggest reported incident was an unknown substance which was thrown into the crowd, affecting three people with a minor skin irritation. 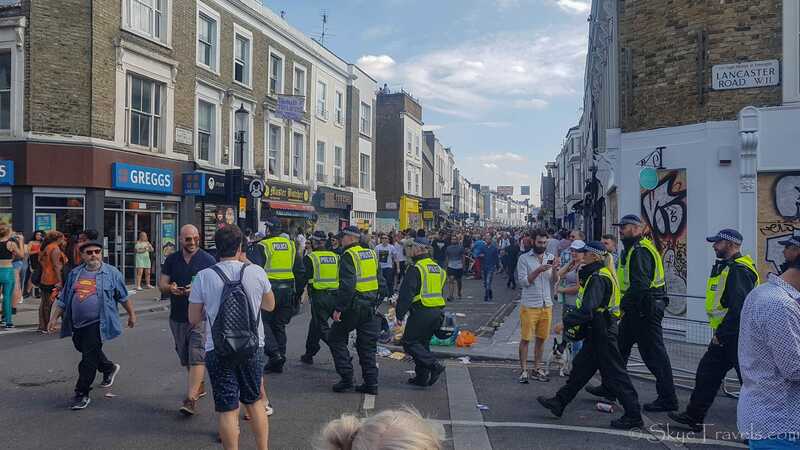 Otherwise, the police said the festival was no more disruptive than a Saturday football match. 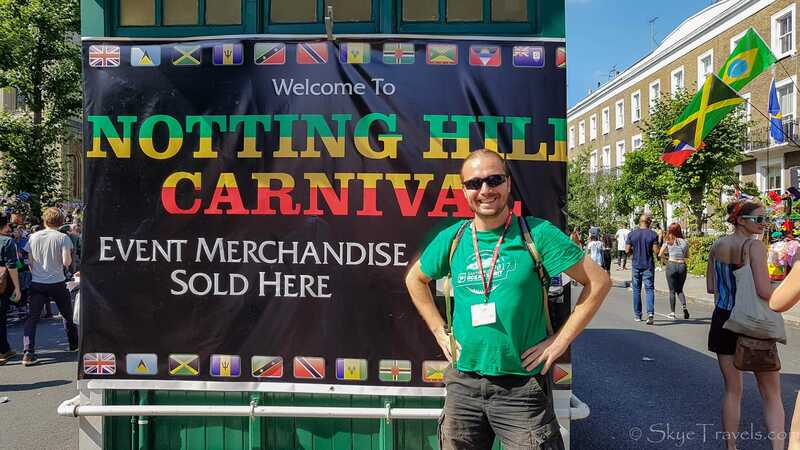 Despite the constant attempt by the media and journalists to portray the Notting Hill Carnival as a dangerous event, I found it very safe and friendly, with the music, food and messages uplifting the attendees. I’d say they did a great job forwarding their missions of the festival. Too bad more news stories don’t promote the positive side of the festival. There are some things that you should know if you want to attend the festival. While this is a holiday weekend, London is used to massive crowds, and there’s no lack of accommodations. I was honored to stay at the Travelodge Covent Gardens, just a few minutes walk from Trafalgar Square and the Seven Dials. From the Holborn station, it was about a fifteen-minute tube ride to the Notting Hill Gate station. Until 7 PM, that station is exit only, keeping the crowds to a minimum. However, from what I saw of the streets around the festival, traffic wasn’t that bad, and a bus would also be an option to get there. 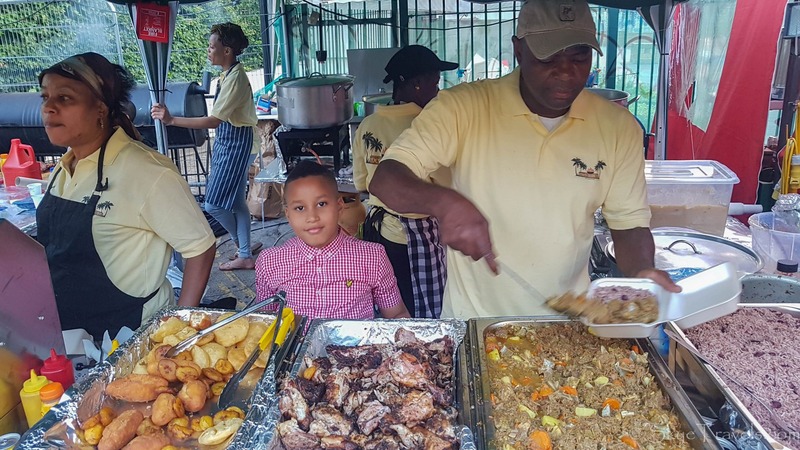 There are over 300 food stalls on the streets of the festival, mostly serving Jamaican and other Caribbean food. There are also hamburger stands, Thai food, Indian curries and many other cuisines. Most plates are £5-£10, and a drink will cost £2.50-£5. A good idea would be to bring your own food, and especially drinks, if you want to save money. Make sure to bring water too, as you might be there for a few hours. For clothes, wear something you don’t mind getting dirty. Parts of the carnival also include a paint party, and slapping each other with melted chocolate. While nothing happened to me, I saw many others who weren’t as lucky. Also wear some comfortable shoes, unless you plan to simply sit on the side of the road and let the parade pass you by. I averaged nearly 10 miles of walking each day of the festival. Public toilets have been set up around the carnival, but expect to see some long queues for them. Many homes also offer the use of their bathroom for a small fee of £2-£3. 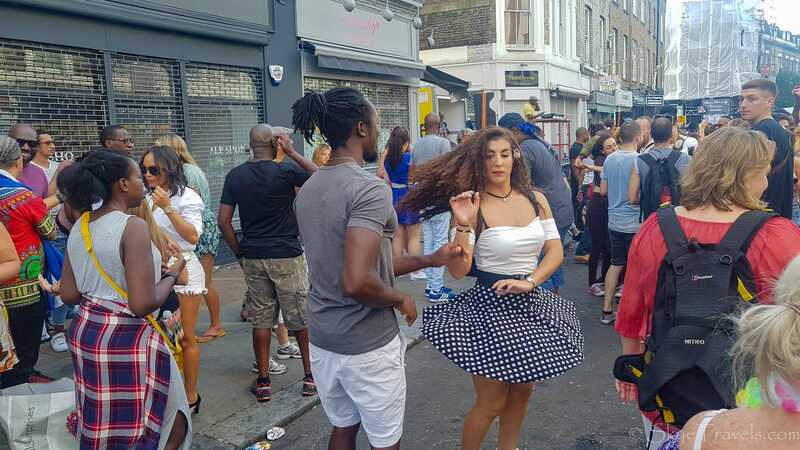 My first impression of Notting Hill Carnival was that it was an unorganized confusion. While two million people do tend to make it a little chaotic, there is actually a massive amount of organization that goes into the event. Aside from all the work done by emergency services and the 300 food stalls, the performers, parade floats and band stages integrate into a pretty spectacular event. 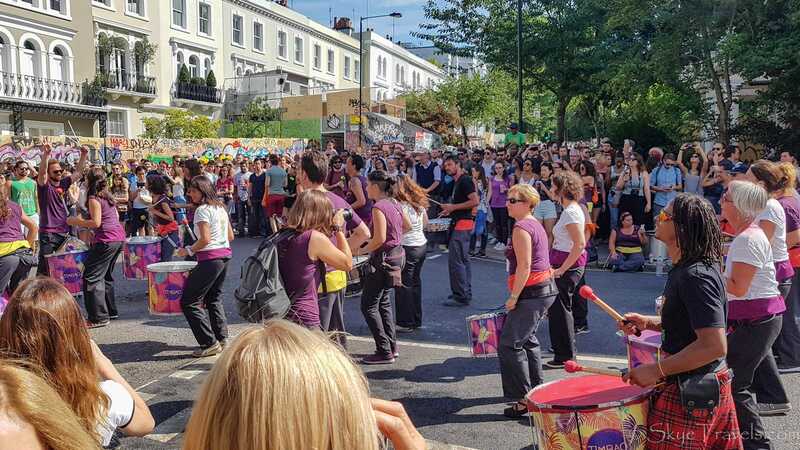 There are 38 band stages set up among the streets of Notting Hill. It’s been a long time since a band like Pink Floyd performed at the festival, but the locals musicians keep the crowd dancing and having fun. The parade is quite different than any other that I’ve seen. 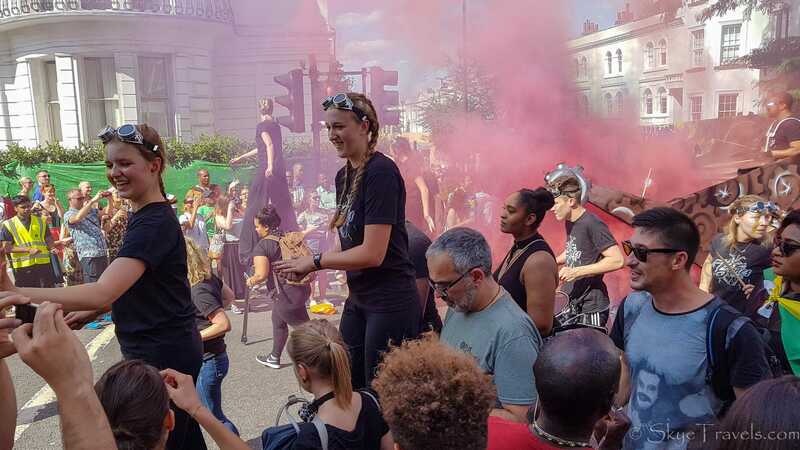 Instead of a straight parade lasting for an hour or two, at Notting Hill Carnival the parade is a 3.5-mile circular route. It starts at 10 a.m. on Monday morning and lasts until around 6 p.m. It doesn’t move fast, and there’s a good chance you won’t see all the floats. The performers in the parade are made up of mas bands, mas being short for “masquerade.” Each band has 30 to 300 performers, all wearing hand-made costumes. Some costumes are more decorative than others, and more than a million man hours went into making them all. On the first day, Kacie and I wandered around the streets, watching several of the bands play and trying some of the Jamaican food. The crowds weren’t bad and the atmosphere was pleasant. Not a lot of people were dressed up yet, as the costumes are saved for the parade. The second day was far more active and busy. We didn’t arrive until nearly 1 p.m. and the parade was in full swing. At first we tagged along with a single float, swept along by the surging mass of the crowd following the music. Eventually we pushed our way forward, seeing other floats and dancers. There were points where the street was wide and we were able to make headway. By the canal, the street got more narrow and moving through the crowd was a tedious affair. Instead, you tended to be pushed and pulled by the thousands of other people…and it continued to get worse. Finally we broke away from the parade, finding solace by one of the stages. After a short rest, we opted to call it a night. We had a dinner scheduled at Native in Neal’s Yard that evening and didn’t want to be late. Overall I had a wonderful time at the festival and was very glad I got to attend, even if it meant missing the last couple days of the Edinburgh Fringe Festival. 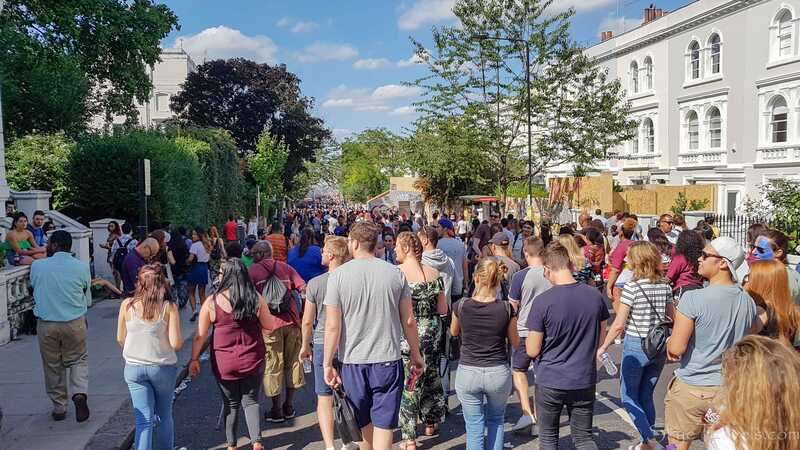 Despite the small hiccup of the “unknown substance” and all the bad media hype, the Notting Hill Carnival 2017 was a great success. 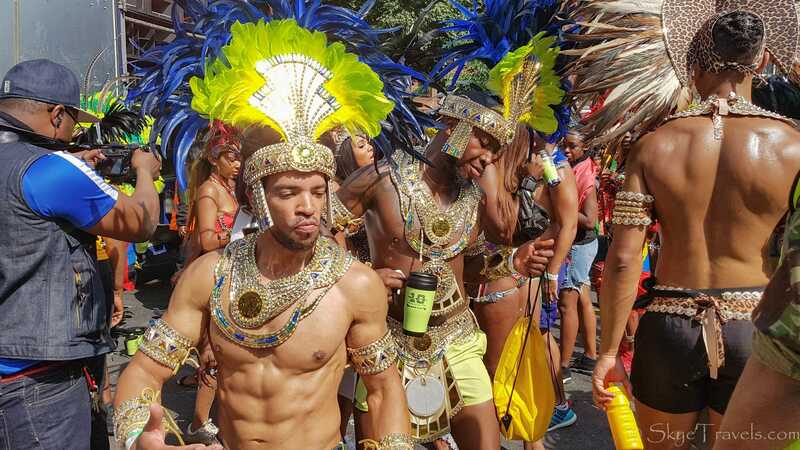 It brought together nearly two million people from across London and abroad to enjoy the music, good food, incredible costumes and other festivities. The Carnival in Rio, the only larger street festival the world, could learn a thing or two from its London counterpart. 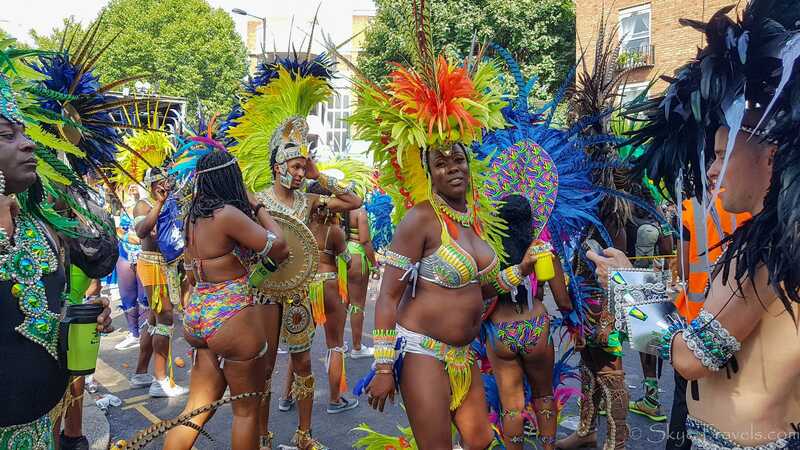 I had never heard about Notting Hill carnival and this for sure looks like fun, quite colorful and vibrant. Acid attack is what scares me out. But you mentioned that there is quite huge amount of security too. So, can add to my list and check in future. thanks for sharing. Thanks. I assure you, the festival is quite safe, despite what the media tried to portray. I’m sure you would love it. Hope to see you there next year. I had every intention of going to that this year, but didn’t get to. I love walking around Notting Hill just on a normal day, I can only imagine what it’s like during the festival. I’m putting it on my list for next year. I hope you make it next year. I think you’ll love it! One learns everyday! I had never heard of this festival. Thanks for the comprehensive writeup on the event. Maybe one if the days I will be London during this period! You’re welcome. I think you would really like it. I might be there again next year too, if I’m not still in Africa. This looks like a party and a half! It’s good to see so many cultures come together. With all festivals there is always some petty danger. It’s good to see that so many police officers are there to keep people as safe as possible. Thanks. I definitely felt safe there myself. I only wish I had been the one to get the Youtube videos of the police there dancing in the streets to the music! Looks like a fantastic time! It really is a shame that news networks and other media outlets only show the bad side of the festival, but I feel like all news coming from news networks is bad news. I rarely see them showing any good news, so I’ve learned to take it all with a grain of salt. I learned a long time ago not to let a bad first impression influence my opinion of an entire place. So true. There simply wasn’t anything bad about this carnival, no matter how hard they tried to find something. I’m looking forward to the day when the media and journalists start concentrating on the good news rather than the bad. Our culture will be so much greater when that happens. This festival is absolutely one of the best events I have ever been too. The fusion of old-worldly London with its beautiful buildings, the splash of colour and excitement and access to incredible food. It’s wonderful. Thanks! So true. I actually watching Notting Hill after the festival, just to get some background to the location – even if it was just a Hollywood movie. I really can’t believe how that carnival isn’t one of the most famous in the world, even if it’s one of the busiest. I’ve spent years looking for festivals to go to around the world, and this one never came up. Wow, what an amazing festival. Love the colors and range of people. Looks like fun! Thanks! I certainly had fun there. It’s the kind of event I think everyone should partake in at least once. Thanks! I’m actually surprised how little this festival is advertised, and yet it’s the second busiest one in the world. Just goes to show the power of word-of-mouth.